we're sorry to tell you, but pinchers' performance is cancelled on all dates! but we're glad to tell you that spectacular jumps in!!! dancehall singjay half pint recorded some of the genre's early classics during the first half of the '80s. his appeal outside jamaica was somewhat limited by his willingness to repeat simple musical ideas, but the best of his work was frequently brilliant. he was the first major artist produced by prince jammy (later king jammy), and together they helped establish a lighter, more relaxed, more melodic approach to dancehall that made for an easy transition into the digital ragga era. while half pint's subject matter was mostly romantic, he also offered the occasional conscious lyrics, which for a time made him an exception in the dancehall world among both singers and djs (his vocal delivery contained elements of both styles, but was weighted more toward the former). half pint was born lindon roberts (though he's also been credited on albums as lyndon, linford, linton, and london) on november 11, 1961. he grew up in the rose lane area of west kingston, and earned his future stage name early on for his small size. he first sang in his school choir, and after finishing school in 1976, he set about trying to break into the music industry. he paid his dues by touring with various sound systems for several years, and in 1983, he finally landed a shot in the recording studio with prince jammy, then a prot�g� of king tubby who was just starting to establish his own career. half pint's debut single, "sally", was released that year, and its follow-up, "winsome", became his first hit. more hits -- chiefly for jammy -- followed over the next two years: "money man skank", "one in a million" "one big family" "pouchie lou", the socially conscious "mr. landlord", and the all-time dancehall classic "level the vibes". his first mini-album, money man skank, appeared in jamaica in 1984, and was followed by the u.k.-only lp one in a million later that year. in 1985, half pint accompanied sly & robbie on their international taxi gang tour, and subsequently cut several singles for them: the hit "night life lady", "hold on", and "world inflation". later that year, he moved on to work with producer george phang, which resulted in his signature song, "greetings". a pacesetter for the new ragga style (i.e., all-digital productions), "greetings" was an enormous hit and stills ranks as a dancehall classic. 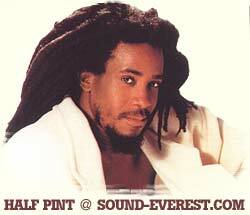 half pint followed it with another classic in "cost of living", and issued an album called greetings; some of the same territory was covered by the international release victory, which was titled after his subsequent jamaican chart-topper. in 1986, the rolling stones covered his early hit "winsome" on their dirty work album, under the new title "too rude". with dancehall tastes shifting toward slack and violent material by the late '80s, half pint found his bright, amiable style slipping behind the times. he continued to record steadily, but his commercial success declined at a rapid pace. he was able to recapture the public's attention in 1992 thanks to the smash hit "substitute lover", which took its place among his finest singles. however, he spent much of the rest of the '90s away from the recording studio, during which time several compilations were released (including vp's eponymous set from 1997, which covered many of his best-known songs). meanwhile, another rock band covered one of his songs -- this time sublime, with their 1996 version of "loving". half pint finally returned to action with 1998's full-length legal we legal, and followed it two years later with closer to you. 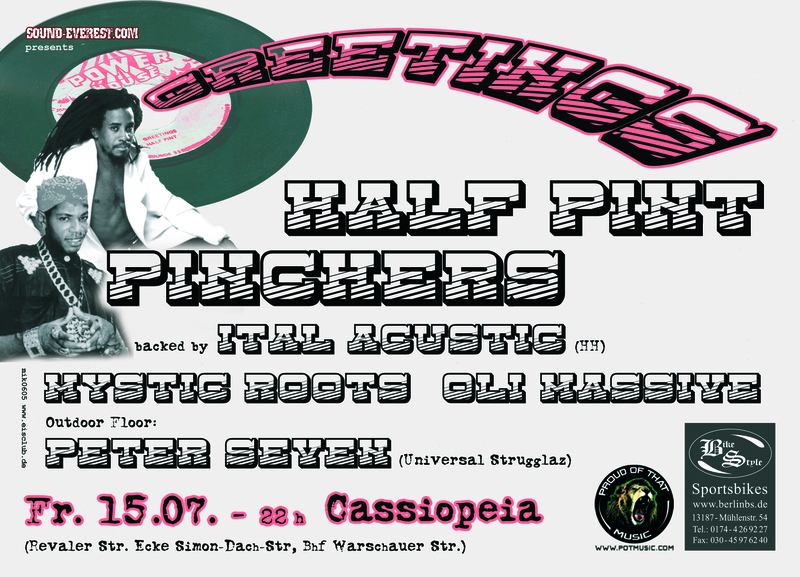 half pint's diminutive stature belies not only his vocal capabilities but also camouflages his huge on-stage presence, often described as no less than explosive and dynamic. born lindon roberts, but affectionately called pint, he is a product of the west kingston enclave of rose lane, a community which has produced the likes of bob marley, dennis brown, peter tosh, lee "scratch" perry, toots hibbert and a host of other international reggae superstars. roberts' exposure to the big screen has come with the movies the mighty quinn (1989), substitute 2 (1998), and mookie (1999), all original motion picture soundtracks. appearances on major music television channels like mtv, has farther helped to encrypt the respect he enjoys from industry personnel and fans alike, solidifying his reputation as one of reggae's few living legends. in 1998, half pint was endowed with one of the greatest honors of his career when he signed with the prestigious bmg music publishing company. to date, he is the only reggae singer to accomplish this feat and has in the process, joined fellow bmg artists including whitney houston and other world music giants as a member of the bmg family. despite being noticeably absent from the recording studios for most of this decade, half pint enjoyed relative success on legal we legal (his first studio album within a ten-year period). this was followed by a 15 city us tour with anthony b. with bmg music publishing and half pint music inc. he is armed and ready to rule the new millennium with a bang! as a man recognized the world over for his positive contribution to the upliftment of mankind through reggae music, pint was presented with "the keys to the city of lauderdale lakes" by the mayor of that florida suburb in 2000.
the future looks particularly bright for this artist who has demonstrated that trends are indeed transient. as he sings on his album closer to you, he will be around for a long time to "pass it on" with "justice, peace, and unity" through quality lyrics and songs. when pinchers first came to england from jamaica in 1985, he had already recorded an album for blue trac, alongside peter chemist. it was the release of "abracadabra" that first won him significant attention. he followed up with minor hits for a variety of producers, including philip "fatis" burrell and red man. the single to make the breakthrough, however, was "agony", recorded for king jammy. it quickly made him a minor celebrity in jamaica, to the point where he was offered (and accepted) advertising endorsements from a local vineyard. his other notable hits include "bandolero', the wild west imagery of which neatly seduced the dancehall audience, whose preoccupation with guns and violence it echoed. 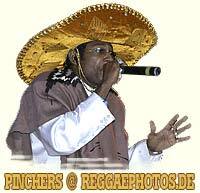 however, pinchers' main source of fame continues to centre on sound system "specials", live appearances at which he excels, and on which he has built a considerable reputation as one of reggae's emerging stars.